One day everything that you worried about before will be gone and all that you will be thinking about is the good times that you had back then. Reach for those good memories, you can't get them back but you can live to make new good memories. Your life isn't behind you. 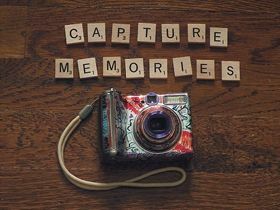 Your memories are. The pain you feel today will be the strength you feel tomorrow. The past is like using your rear view mirror in the car. It's good to glance back and see how far you've come, but if you stare too long you'll miss what's right in front of you. You can't bring back the past, it's gone. Keep moving forward and make better memories for the future. Remember the past, Love the present, look toward the future, never forget, always forgive, don't regret decisions, live every day as if its your last. There is a cleansing that takes place in Letting Go. When we fall down in our Past and roll around in our Past, people will many times see our Past before they know who we have become. Letting go is like being baptized with the Past being washed away so we can be clean and start fresh. While the Past will always be a part of YOU it doesnt mean you have to live there or bring it with YOU. Let memories make YOU strong, but let go so YOU can grow and move on. Memories are present in everyone. It is hard to live without memories whether you are young or old- but older people in comparison hold more memories. No matter how far we travel, the memories will follow. Memories have the capability of taking to thousands of miles away in a fraction of a second and needs no airline reservation or baggage. Some of the sweet memories linger in the minds forever but some may be daunting memories. It is impossible to contain both types of memories. “Memories are hunting horses whose sound dies on the wind”, goes a proverb. Memories of friends and dear ones should be always preserved like a fortune while the bad deeds and memories should be forgotten as soon as possible. “Memory is the diary that we all carry about with us “said Oscar wilde. But it is a very secret diary and no one else can read it. Here are innumerable quotes on memories. Read them and share with your friends.